The Proven Off-Road Kodiak 450 EPS packs superior off-road capability, comfort and confidence into the best-performing mid-size ATV you can buy. GENEROUS GROUND CLEARANCE: Kodiak 450 EPS offers 9.6 inches of ground clearance and full-length composite skid plates to deliver maximum underbelly protection for a wide variety of terrain. CLASS-LEADING POWER STEERING: Yamaha’s Electric Power Steering provides the industry’s best balance of steering assist and positive feedback by checking gear position, 4WD mode and speed to match terrain conditions in real time. COMPACT CHASSIS: Yamaha built the new Kodiak 450 EPS with a compact body design that is significantly less bulky than competitive models, for precise handling and a confidence-inspiring ride in a variety of terrain conditions. SMOOTH FUEL-INJECTED ENGINE: Kodiak 450 EPS features a torquey 421cc SOHC engine designed to provide a balance of responsive power and smooth character for long riding days with minimal fatigue. Mikuni® fuel injection means easy cold starts and flawless fuel delivery in nearly any condition, while liquid-cooling and a high-volume fan system ensure reliable, consistent performance for years to come. ULTRAMATIC TRANSMISSION: The Ultramatic transmission features a gated shifter, with park, dual-range (Hi/Lo) drive, and reverse gear, and is specifically tuned to provide lowered cruising rpm for smooth, quiet operation. Even the position of the gated shifter was carefully considered, being moved forward to provide a roomier rider area. YAMAHA'S EXCLUSIVE ON-COMMAND 4WD: The On-Command 4WD system on Kodiak 450 EPS lets you switch between 2WD and limited-slip 4WD with the simple push of a button. This driver-controlled system eliminates hesitation or slipping while waiting for computer-controlled systems to engage, which is common in some competitive models. FRONT DISC BRAKES AND SEALED WET REAR BRAKE: Hydraulic front disc brakes serve up powerful and consistent feel and braking performance to add to rider confidence, while the sealed rear brake is protected from dirt, rocks and mud. HEAVY DUTY TIRES: Beefy 25-inch tires feature an aggressive tread pattern and provide a balance of precise steering and optimized comfort to make the most of available traction. READY TO TOW AND HAUL: Rugged, large-diameter steel cargo racks with durable wrinkle paint finish can pack a total of 264 pounds combined. A heavy-duty ball mount comes standard and Kodiak 450 EPS can tow more than 1,322 pounds. COMPACT BODY, ROOMY ERGONOMICS: Kodiak 450 EPS offers a riding position with the same roomy feel as the larger Kodiak 700. 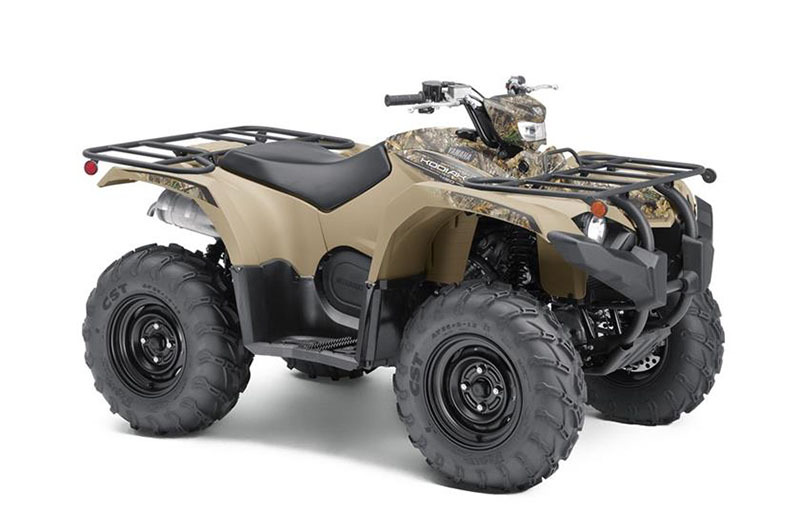 With tall handlebars, a seat that is long and plush for improved rider comfort for extended work days, large textured floorboards, and a new oversized thumb throttle, every aspect of the Kodiak 450 EPS was designed to bring class-leading levels of refinement to the middleweight 4x4 ATV segment. RUBBER ENGINE MOUNTS: Kodiak 450 EPS features newly developed rubber engine mounts that isolate vibrations from the engine bay and give the rider one of the smoothest rides ever offered in a utility ATV. INDEPENDENT FRONT AND REAR SUSPENSION: The Kodiak 450 EPS features independent double wishbone suspension for an optimized vehicle stance, light steering feel, and improved feeling from the shocks across the entire range of travel. With 6.7 inches of front wheel travel and 7.4 inches at the rear, Kodiak 450 EPS provides excellent rider comfort even in the roughest terrain. LOW-EFFORT ELECTRIC POWER STEERING: Yamaha’s Electric Power Steering significantly reduces fatigue with predictable steering assistance that adapts to changing riding conditions for an exceptional feeling of control. ADVANCED LIGHTING: Kodiak 450 EPS owners also get added visibility and extra illumination, courtesy of the additional halogen work light mounted on the handlebar, under a body-color-matched cowl. STORAGE AND POWER: On-board storage is sealed for protection from rain and mud, and a standard 12V power port makes it easy to keep devices charged over the course of a long riding day. THOROUGH INSTRUMENTS: A compact all-LCD instrument cluster gives the rider a clear picture of speed, transmission status fuel level and more, in a modern and compact package. ULTRAMATIC DURABILITY: Yamaha’s Ultramatic system earns its place as the most reliable transmission in the market. An automatic centrifugal clutch maintains constant belt tension for reduced belt wear and a sprag clutch provides Yamaha’s renowned all-wheel engine braking. HIGH-MOUNTED AIR INTAKES: Kodiak 450 EPS features high-mounted air intakes to ensure that water and debris can’t get into the drive system or engine air cleaner, with a reusable foam air filter for the engine side that is accessible without tools. These air channels provide plenty of cool, clean air for the engine and ensure that the V-belt remains cool in the toughest of working conditions. MARINE-GRADE ELECTRICAL SYSTEM: Yamaha ATVs feature marine-grade waterproof connectors for maximum weather-proofing, maximizing durability and improving serviceability, too. SIMPLIFIED SERVICING: The Kodiak 450 EPS powertrain is designed to make service and maintenance as stress-free as possible. The airbox features tool-less access to the air filter element, the engine and differential feature convenient oil drain holes, and vehicle electronics are located high on the chassis, under the front center panel, for easy access. AGGRESSIVE AND DURABLE STYLING: Uniquely textured, injection-molded fenders protect against rock and debris damage to stay looking good season after season, with styling cues borrowed from Yamaha’s industry-leading range of big-bore ATVs. READY TO PERSONALIZE: With winch wiring pre-installed at the factory, and a range of Genuine Yamaha Accessories designed in concert with the machine, Kodiak 450 EPS is ready to be configured to suit nearly any job, from towing and field work to hunting and recreational riding. ASSEMBLED IN USA: Assembled Real World Tough™ in Newnan, GA, U.S.A.
ULTRAMATIC® AND ON-COMMAND®: Kodiak 450® EPS brings Yamaha’s renowned combination of the industry’s most durable automatic transmission—Ultramatic—with the rider-centric control and traction of On-Command selectable 4WD. The result is outstanding capability with the confidence to get you through the most challenging terrain and back again. TERRAINABILITY: With standard full-length skidplates, nearly 10 inches of ground clearance and independent double wishbone suspension with adjustable shocks, Kodiak 450 EPS is ready to tackle rough terrain without breaking a sweat—and with the sort of rider comfort that makes long rides a blast, too. COMPACT CHASSIS: Unlike many middleweight utility ATVs, Kodiak 450 EPS isn’t just a smaller engine under a full-size body. Yamaha built the Kodiak 450 EPS from the ground up to give riders a compact chassis for precise handling and maneuverability on the trail. ROOMY ERGONOMICS: To ensure that riders of all sizes can make the most of Kodiak 450 EPS, the ergonomics were designed for maximum flexibility. Riders large and small have room to move around thanks to a long, comfortable seat and wide floorboards. The Kodiak 450 EPS handlebar bend is shaped for riders of various heights, and little touches – like the new thumb throttle – improve comfort for any rider. 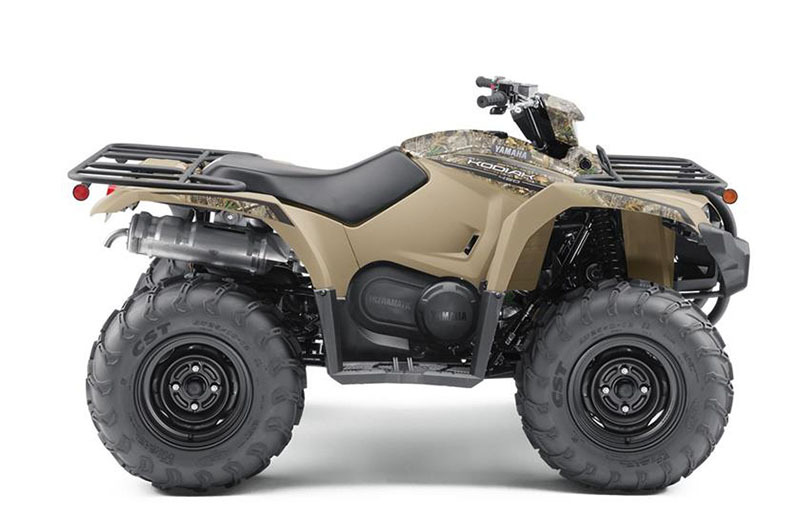 REAL-WORLD TOUGH: Like all Yamaha ATVs and side-by-sides, Kodiak 450 EPS uses a range of features to improve durability and serviceability, from the tool-less air filter design and oil drain ports, to the high-mounted air intakes and marine-grade electrical connectors. Front rack - 88 lb.